I can’t believe that another year has passed and we are still prohibited from taking our fair share of grouper during the time of year that they are actually, most readily available in our waters. That being said, I guess that we are really lucky that there are so many other species available to pursue. Other reef fish, like the wonderful variety of snapper found on our reef line along with the non-benthic critters like cero mackerel and yellow jack help fill the void left by the removal of the grouper from the menu. Chumming over the patch reefs will bring in a great variety of fish with which to fill your cooler. Some of the variables that will determine the success of your chumming are the rate that the current is flowing and wind direction as it relates to the direction of current flow. The best results are achieved when you are able to anchor up current of the patch reef that you want to fish and the wind is blowing the same way. This allows your chum to flow directly behind the boat and also for your chum to flow across the body of the patch reef. Good current flow is also important to spread the scent of the chum along with tiny morsels with which, to not only draw in the fish, but also to get them into the feeding mood. 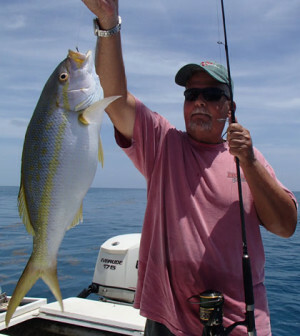 If the rate of the current is too slow the chum will only serve to entice the fish in the immediate vicinity of your boat and also will have little chance of building an all important school of bait fish. If you can form a school of ballyhoo behind your boat it is all but a guarantee that you will be able to come away with a dinner to be proud of. If you are one to believe in reincarnation, you should hope that you do not come back as a ballyhoo. Your life expectancy in your new form will tend to be short indeed. At least you will quickly be able to move on to bigger and better things in short order. That being said, suffice it to say that just about all of the reef denizens with few exceptions are a fan of the Hoo. Getting a few ballyhoo for bait is usually an easy task if you are adept at throwing a cast net. If not, a gold hair hook with a tiny piece of shrimp or squid will serve to bring them to the boat one at a time. These fish can be used either live, bridled to a short wire leader and left to swim on the surface, or used as cut bait in large chunks on a knocker rig on the bottom. Whichever method you choose, there is sure to be fast action to follow. As most of you know by now, I suffer from fishing ADD and have an attention span just ever so slightly longer than it takes to get a fish into the boat before needing to try for something bigger and better. In January, bigger and better usually comes in the form of the elusive sailfish. Staring at a baitwell full of lively ballyhoo after a short time starts to scream sailfish. So hopefully my charter has their fill of bottom fish about the same time so that it is not too difficult to talk them into changing gears and moving the short distance offshore, to try for a pelagic slam. I consider the slam this time of year to be sailfish, dolphin and tuna. I know that there are plenty of other sets of three to make up a slam but that is my personal favorite. wc-P6080806Bridling a live ballyhoo to a long piece of 50 to 60 pound fluorocarbon is a pretty simple task. I start with an appropriately sized circle hook for the size bait and then use about a half piece of copper rigging wire fastened directly to the hook. The hook is placed up through the ballyhoo’s lower jaw and then the rigging wire is wound down the bill and hook. If there is enough of a breeze to keep the boat drifting fast enough to keep a few lines trailing behind the boat without running afoul of each other, then drifting quietly between 150 and 250 feet of water seems to be the area that I draw the most strikes. If the drift is too slow you can idle slowly ahead or just kick the boat in and out of gear to keep the baits moving without crossing each other up. I feel the need to interject a public service announcement at this point. It is important that your choice of outboard has the capacity for a modicum of stealth if you are going to slow troll live bait. The quieter your choice of outboard, the better your chance of not spooking your quarry. I have chosen my E-TEC motors because of many factors not the least of which being the ability to idle quietly and more efficiently than other engines. If you are running loud old two stroke motors you are better off drifting with the engines off. Of course there are other ways to fish live bait offshore. One of the most notable is to use a kite to keep a greater spread of bait around the boat. The kite allows you to keep baits in front of your drift so that the bait gets to the fish before they can be put down by the passing of the boat. Kite fishing is a skill that can be started quite simply at first and can be expanded upon as your skills increase. You can start with one kite and one or two release clips and then move to multiple kites weighted to fly at different angles as your skills increase. One last bit of advice is to keep your bottom finder zoomed in to the bottom as you drift. In the lower Keys there are precious few hard bottom spots in the area outside of the reef line. Keeping an eye on the bottom can show you both bait and game fish holding over what appears to be flat sand but is really hard bottom with holes and some low profile growth on them. 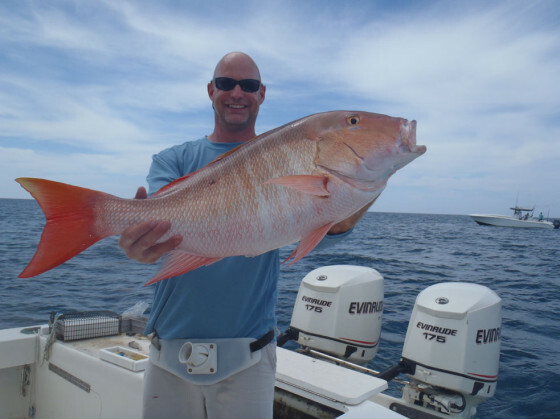 Once you mark a spot like that you can go back and drop a live bait or vertical jig and see if you might not come home with a trophy mutton snapper to sweeten the pot.